An American favorite, the ice cream sandwich. Photo by Lali Masriera | SXC. This is Page 3 of a five-page glossary on the types of ice cream. This page explains the different types of standard ice cream. 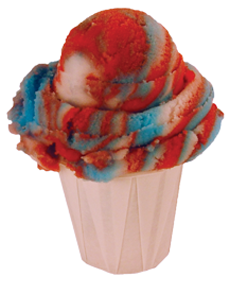 It also contains terms such as ice milk and Italian ice. See all of our delicious food glossaries. A frozen product made from cream, often combined with milk, flavorings and sweeteners. It has a high percentage of milk fat (butterfat), and the minimum percentages are regulated by law. Often, up to 50% of the volume of a container of ice cream is made up of air, which is introduced during the whipping process. Premium ice cream generally has between 11% and 15% butterfat and 60% to 90% overrun, which is the air that is pumped into the ice cream. This creates a denser, heavier, creamier, richer and more caloric product than regular ice cream, and is reflected in the price. Superpremium ice cream has even more butterfat—greater than 14%, with some having up to 18% and more—and less overrun, from as low as 20% up to 80%. Premium and superpremium ice creams come in more complex flavors in addition to the basic ones. The superpremium category includes smaller companies that make interesting gourmet” flavors. In addition to lower overrun and greater butterfat, the third way in which a superpremium ice cream can be made more rich is by using an egg custard base, which is known as French or French-style ice cream. Regular ice cream is less dense: it contains 10% to 11% butterfat and more air, 90% to 100% overrun. It is usually sold in the more standard flavors, since the added ingredients of fancy flavors add to the cost. Some people prefer the texture and lesser degree of richness, and prefer it in milkshakes and malteds where the subtlety of the richer ice cream can be lost (or is overkill). By the way, 29% of ice cream sold in America is vanilla, 9% is chocolate, and strawberry and butter pecan are tie for third with 5.3% each. However, these are the flavors most sold in bulk at supermarkets, so the numbers are not that surprising. And it means that 51.4% of the flavors are still favorites, like Cookies & Cream, Mint Chocolate Chip and seasonal specialties like pumpkin, shown here in the photo. 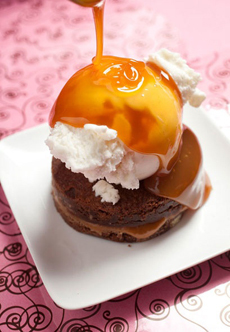 One of our favorites: a brownie ice cream sundae. Photo courtesy Sugardaddy’s. Economy ice cream contains exactly 10% butterfat—the minimum USDA standard, and 95% to 100% overrun. It is made in basic flavors. Light ice cream means that there is either 50% less fat or 33% fewer calories than the company’s standard ice cream*. Read the labels carefully: the “light” ice creams of a superpremium brand often have more calories than the “regular” ice cream of other brands. Reduced fat ice cream has 25% less fat than the company’s regular ice cream*. Similar to the light ice cream analogy above, it can contain more calories than a regular ice cream of another brand. *Or, “compared to leading brands.” Source for comparative milkfat and overrun information: Alan Levitt, Dairy Foods, January 1989, reporting on International Ice Cream Association (IICA) survey of one-third of U.S. manufacturers. 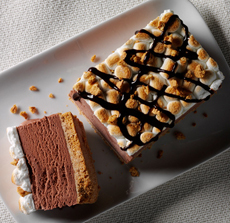 Ice cream cake can take two forms: ice cream in the shape of a cake, often with cookie crumbs or other small representation of “cake”; or layers of ice cream and cake. In the latter, it is up to the cake maker as to whether the middle layer is the ice cream or the cake. An ice cream cake, made in a loaf pan. Photo courtesy Wisconsin Milk Marketing Board. A pie crust filled with ice cream. It can have layers of different flavors and be topped with cookie crumbs or other garnishes. It differs from ice cream cake in that it has a pie crust instead of a cake layer. A low butterfat variation of ice cream, which due to advances in food technology over the last 20 years, has all but disappeared as a term, replaced by reduced fat ice cream. 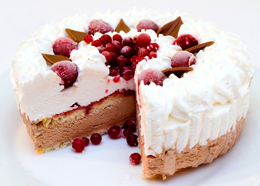 An ice cream pie. Photo by Nataliya | CSP. 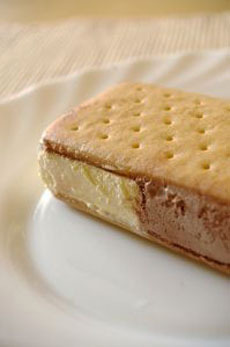 An ice cream novelty dessert that “sandwiches” a layer of ice cream between two thin, cakelike layers or two cookies. While ice cream novelties are handheld, some establishments and individuals serve homemade gourmet ice cream sandwiches, e.g. peanut butter ice cream between two layers of banana bread, that are eaten with a knife and fork. See photo at top of page. One or more scoops of ice cream or sorbet added to either a soft drink (root beer + with vanilla ice cream = Black Cow or Brown Cow, ginger ale + vanilla ice cream = Boston Cooler, grape soda + with vanilla ice cream = Purple Cow) or a soda created with carbonated water and flavored syrup (e.g., chocolate soda). The tiny bubbles of air in the carbonated water both cause the ice cream to float and form large bubbles of carbon dioxide that create a foamy head, similar to a beer head. Beer can also be used as a base for an ice cream soda. A chocolate brew, stout or lambic is excellent—but adults only, please! See chocolate beer. 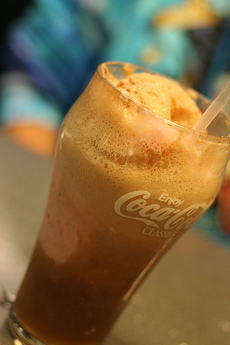 The ice cream soda is also called a “float” because the bubbles of carbon dioxide in the soda cause the scoop of ice cream to float to the surface. Photo courtesy Wikimedia. A smooth water ice, similar to a sorbet but generally a sweeter, snack product rather than a more refined dessert product. It is so-called because it is served in pizzerias and Italian ice shops, as well as by street vendors. Popular flavors include cherry, coconut, lemon and “rainbow” ice. Italian ice in the Rainbow flavor. Photo courtesy Uncle Louie G's Italian Ices & Ice Cream.